Moscow believes the deadly clashes in Kiev were an attempt at a coup by radicalized protesters. EU leaders have quite an opposite view, calling for sanctions against Ukrainian government officials. “The Russian side is demanding the leaders on the streets to stop the violence in their country, immediately resume dialogue with the lawful government without threats and ultimatums,” the statement reads. 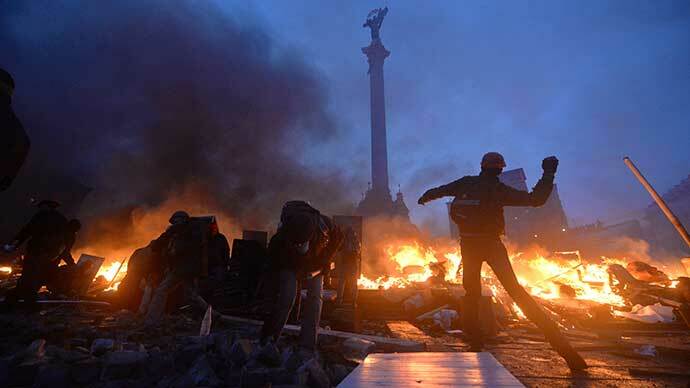 Twenty-six people were killed overnight in the most violent clashes yet to have occurred between security forces and protesters since the opposition took to the streets of Kiev in November 2013. Ten of the casualties are Ukrainian police officers, who died of gunshot wounds, as did the rest of the victims, the Interior Ministry reported. It added that up to 700 people were injured, more than 70 of those being policemen. The Ukrainian Health Ministry officially confirmed that a journalist from the local ‘Vesti’ newspaper, Vyacheslav Veremey, died in Kiev after a gunshot wound. The Ukrainian Ministry of the Interior believes the casualties in the clashes could have been killed by the radicals, because the police do not use fire arms. Some of the European leaders have not been convinced and have been quick to lay the blame for the violence on the Ukrainian president. The Swedish Foreign Minister said on Twitter that blood was on Yanukovich’s hands. British Foreign Secretary William Hague was less emotional, but also accused the government of allowing the bloodshed to happen. Several EU leaders have already spoken of introducing sanctions against the Ukrainian leadership, who they view as responsible for the crisis. Germany, which previously refused to back Washington's calls for sanctions against Ukraine's government, could soon have a change of heart, according to German Foreign Minister Frank-Walter Steinmeier . "Whoever is responsible for decisions that lead to bloodshed in the center of Kiev or elsewhere in Ukraine will need to consider that Europe's previous reluctance for personal sanctions must be rethought,'' he said, according to AP. Polish Prime Minister Donald Tusk said on Wednesday he would be pressing European Union leaders to impose sanctions on Ukraine's government. "I will today hold talks with the leaders of the biggest EU countries and institutions, and persuade them to impose sanctions - personal and financial," Tusk told a special session of the Polish parliament, Reuters reports. "I hope that such a stance from Poland will help the EU as a whole in taking fast decisions." Belgian Foreign Minister Didier Reynders has also supported sanctions against the Ukrainian government, according to Itar-Tass. Earlier, US Ambassador to Ukraine Geoffrey R. Pyatt blamed Viktor Yanukovich for the escalation of the crisis. "From this moment on, the USA holds Yanukovich responsible for everything that happens in Ukraine," he told the Zerkalo Nedeli newspaper, following a meeting with Foreign Minister Leonid Kozhara. Moscow believes that this accusatory position of the US could have, in fact, contributed to the escalation of violence Kiev has been witnessing, and, holding the president solely responsible for the crisis, is giving carte blanche to extremist radical forces out on the streets.